Virus risk ... The disease has killed a large number of pigeons in Victoria. A rare virus that can be contracted by humans has killed a large number of Victorian pigeons after being detected in Australia for the first time. A type of avian paramyxovirus has resulted in the deaths of a number of hobby pigeon flocks. At this stage, there are no reports of this virus causing disease in wild birds, but we have asked the Australian Wildlife Health Network to be alert to this possibility. Australian chief veterinary officer Dr Mark Schipp said the birds had died suddenly in large numbers. The birds had sometimes appeared tired or shown neurological signs such as circling or head flicking before death. He said human infection was extremely rare and usually occurred after contact with an infected bird. “The virus causes only mild, short-term conjunctivitis or influenza-like symptoms [in humans],’’ Dr Schipp said. “State veterinary authorities have been asked to review the health of their pigeon and poultry flocks. Dr Schipp said the national Consultative Committee on Emergency Animal Disease had met twice to discuss the outbreak, which is being managed by Victorian chief veterinary officer Dr Hugh Millar and industry and veterinary authorities. Dr Schipp said the consultative committee has agreed to investigating pigeon and other bird holdings where disease is suspected and to quarantine affected properties. Anyone concerned about their pigeons or birds should contact an experienced poultry veterinarian, their local department of agriculture, or the Emergency Animal Disease Watch hotline on 1800 675 888. Surely this is scare mongering. I know many people, including myself who have isolated & cared for birds showing signs of PMV. Yet not one of them has contracted conjunctivitis or flu like symptoms from their patients. 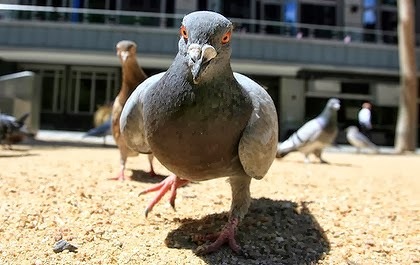 What are pigeons to you Saleem? I am taking care of 1 piegon sick of pmv.I am feeding it daily and have it in my bathroom to save from other birds,cAts etc.Plz comment if i am safe while taking care of that pigeon.